Hi there crafty peeps! I am hear today to share with you my inspiration for the latest challenge over at Craft Hoarders Anonymous. Gloria is challenging us to Celebrate the Season. 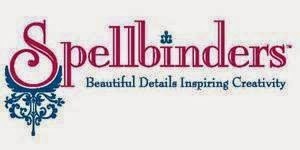 Our DT and prize sponsor this month is the wonderful Spellbinders. I created this lovely serene Christmas card with one of my favorite new stamp purchases from Power Poppy. I absolutely love Marcella Hawley's images, and this one is no exception. I colored the image up with my Copic markers and added some Stickles in Frosted Lace for the snow. The sentiment is from the same stamp set and I stamped it with Memento Luxe Nautical Blue ink. I created the background first by cutting out the colored image with my Spellbinders Labels Thirty One die set. I then masked off the image with masking paper and created a background with Distress Inks in Tumbled Glass, Salty Ocean, Dusty Concord, and Chipped Sapphire. I sprayed some Lindy's Stamp Gang spray on top to create a snowy look. I left the metal die on the paper while inking the background to create a white frame. The paper is from the Bo Bunny Powder Mountain collection. The silver cord in from Really Reasonable Ribbon. It adds the perfect accent without taking away from the colored scene. We have a wonderful prize up for grabs to one lucky winner, so make sure you head over to the challenge blog and join in. Now go and see what the other DT members have cooked up for inspiration. Amber, this is one of the most gorgeous cards I've ever seen. 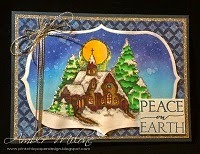 I love the blue and gold elements and the wonderful wintry scene you created! Makes my heart merry! Hugs! Wow, this is really beautiful and classy! I love the gold/royal blue paper! 'And you did a really nice job on coloring the image! Thank you for sharing! What a beautiful creation! I love your coloring and the snow you added is just wonderful! That sprayed background is amazing in itself but that colored image...wow! This is just beautiful. Amber, beautiful card. Love the Christmas scenery. This is beautiful. I love the scene and glitter border. Such an amazing card! I just love your copic coloring! Thanks so much for this lovely inspiration.